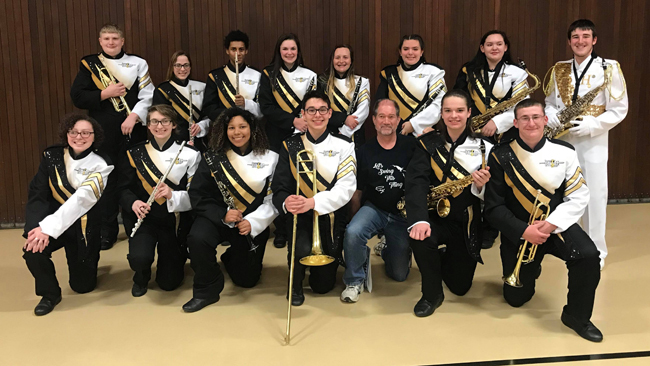 Fourteen Henryetta high school band members added their skills to the annual Okmulgee County Honor Band performance Thursday night. Band members from Okmulgee, Henryetta, Beggs, Morris and Dewar spent the day rehearsing in preparation for a concert that evening. This was the first time the HHS band members were able to show off their new uniforms to the general public. “This gave our kids an opportunity to learn how to work with others that they had never been around,” said band director Alan Montgomery. Henryetta students participating included Sarah Patruska, Kendall Tanton, Nathanial Johnson, Kenna Najera, Bailey Davis, Ragan Runyon, Skylar Thomas, Zach Dickey, Tyler Sisson, Quinton Story, Ryan Sadler, Joe Garcia, Maddie Walters and Talton Martinez.